You know what is the most loved benefit of taking a social media sabbatical? It is all your messages that I receive when I get back. The love, the care that you all have for me is so immensely satisfying. I might not have a million followers, my blog might not have a million readers, but you wonderful people who have always showered your love on me, guided me, praised me, have been the driving force to my humble efforts, you all are so close to my heart. Whenever I vanish, you message or mail me, enquiring about my whereabouts and that’s what keeps me going. 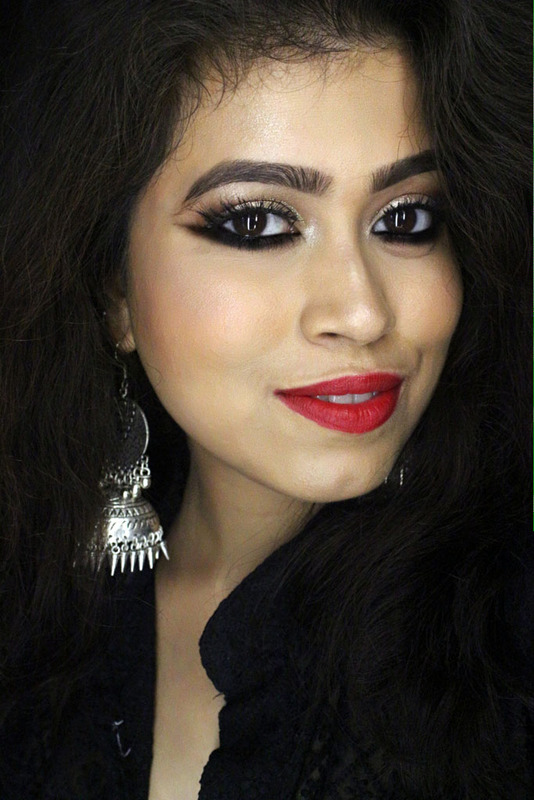 Anyway, coming back to today’s post, Farhana, a reader of my blog, requested for a simple, yet glamorous Eid makeup look. I am currently having a serious ‘lack of ideas’ issue, feeling disengaged and demotivated. Moreover, my skin is not in her best mood. She is puffed up, itchy and is literally burning. So I just apologized and told her that I won’t be able to do any. I also send her a few links of my favorite Eid special looks of other bloggers. But the stubborn girl she is, she kept on badgering me for days until I finally gave in. Girl, you are very difficult, but I love it. Thanks for being there and trusting my work, thanks for loving and supporting me. Usually I prefer doing my eyes first, so that if there are fallout, I can easily clean them off. But for this look, I have done my base before, simply because this look is more of a heavy kohl smudged eye makeup with light wash of eye shadow and I needed the perfectly done canvas before doing it. But it is totally up to you, you can do eyes first and the base later or the other way. 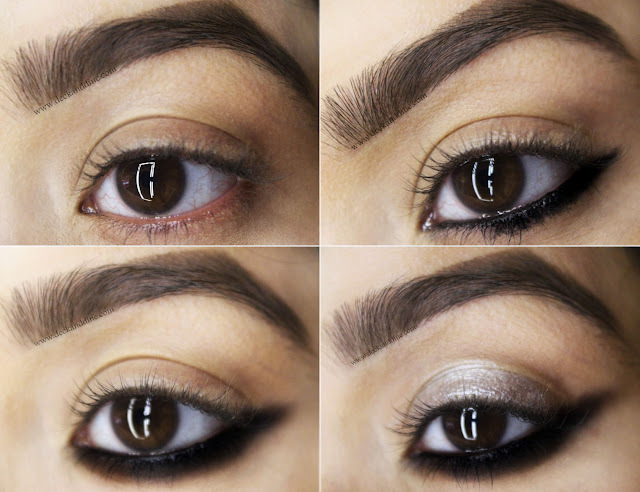 Start by grooming your eyebrows and setting eye lids with a skin color eye shadow. Now take your favorite kohl and start lining the lower lash line, thicken and extend the line on the outer corner. 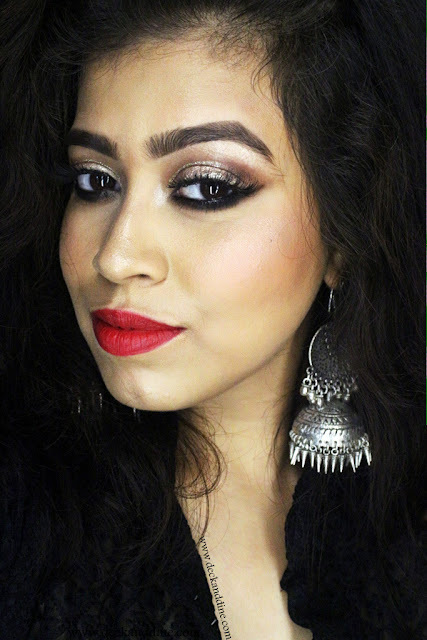 Take brown eyes shadow on a smudge brush and smudge the kohl. Line the waterline again to have a crisp look. 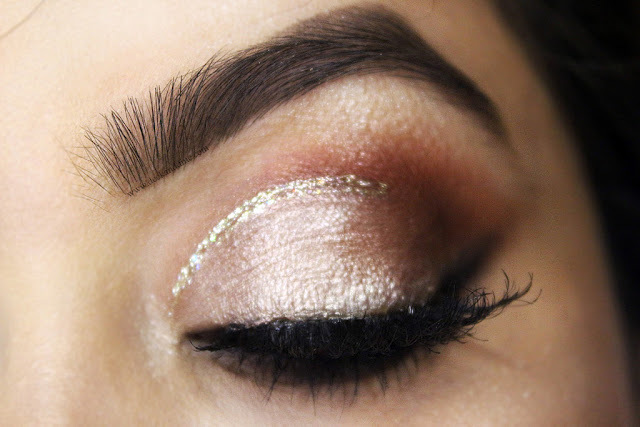 Moving on to the lid, apply a shimmery champagne on the center of your lid. You can change the lid color as per your wish. 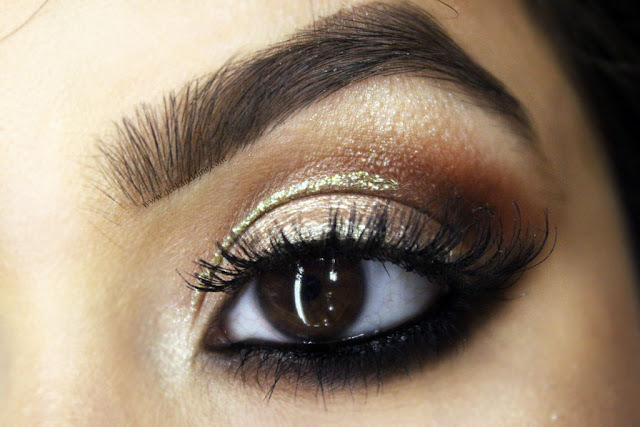 Take a small brush and swirl it over a dark brown eye shadow and trace it on the crease following your socket line. 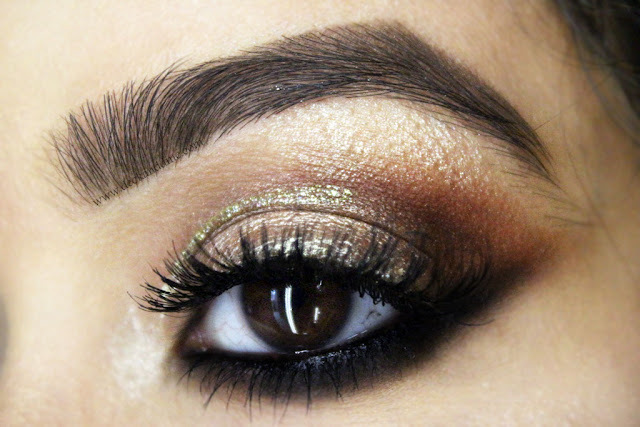 Taking a lighter brown on the fluffy brush, go to and fro on the crease and outer corner. 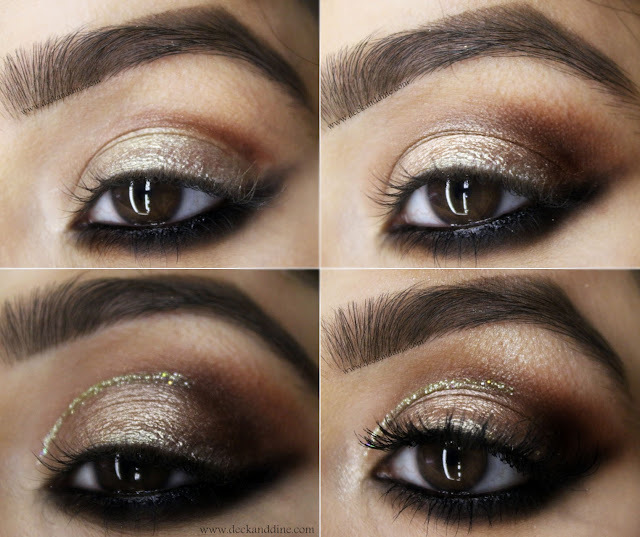 The next step is optional, but takes the eye makeup to a completely different level. Add a thin line of glitter liner just on the inner socket line. Apply highlighter on your brown bone and inner corner of your eyes and coats of mascara to round off the look. Do your base as you would usually do. Make sure you correct and conceal wherever needed. I skipped contouring and went with a swirl of peachy blush on each cheek. Also I dusted some highlighter on the bride of my nose and cheekbones. That’s my favorite part. 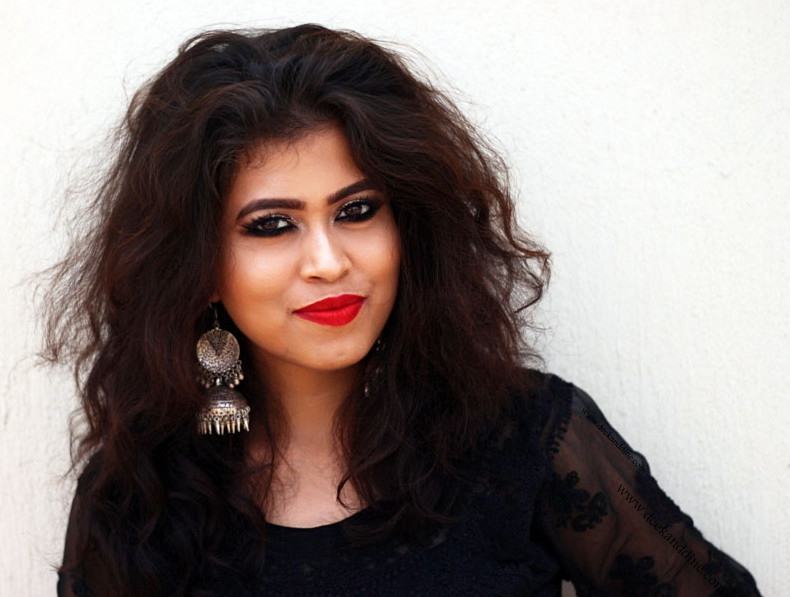 For lips, what else than matte red lips? Don't forget to tag me in if you recreate the look, would love to see. Amazing look! The dramatic under eye is so beautiful! 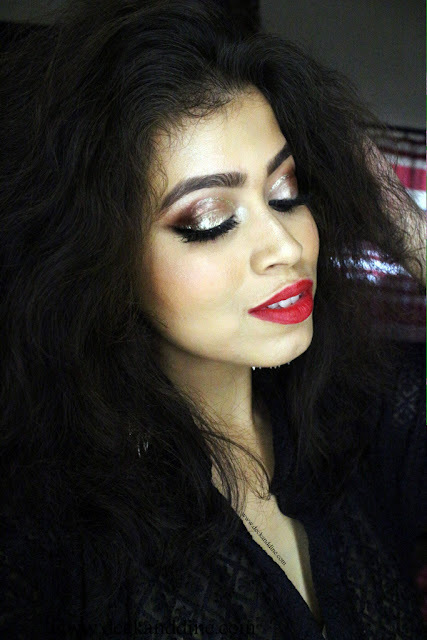 The glittery crease line is the icing on the cake! I love your brows. I'm jealous of them. Absolutely stunning -- I've been so into putting a glitter liner in my crease too! So gorgeous. I love the addition of that glitter crease. It’s perfect. You look amazing! I love a good matte red lip as well! I have no idea what an EID look is but I do like this look on you. Looking fierce! Love the eyes! But I hardly ever wear red lips, I prob would have gone neutral lips. I've seen a few people talking about EiD looks. What does that mean?